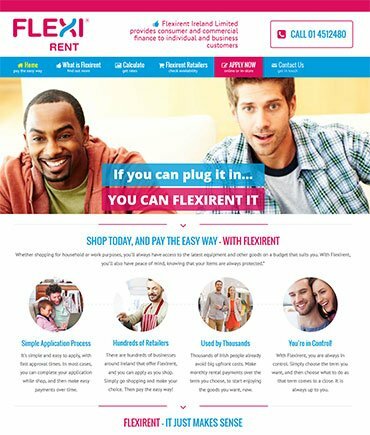 Flexirent, headquartered in Australia and based in Blanchardstown in Dublin with operations around the world, is the easy way for consumers to pay for new technology, furniture, and other household goods. By agreeing a manageable monthly payment, they can take home their new goods on the very day they go shopping – without facing a big upfront expense. Flexirent operates with all major chain stores and several leading independent suppliers. However, their existing website for Ireland did not fully reflect their standing, nor portray the right image for such a progressive and accessible operation. They contracted us to give that site a major makeover. We engaged with senior representatives of Flexirent, to gain thorough understanding of what they wished to achieve. We established that while usual practice in Ireland is for consumers to apply in-store when they’re already shopping, rather than apply in advance for pre-approval, the brief was to create an attractive, easily navigable, website to explain what Flexirent is, how it works, and to allow online applications. Once that outline plan was agreed with our clients, we were good to go. We tailored their pre-existing text content to the Irish market, to give the Flexirent Ireland website a more Irish feel and tone. Alongside this, we studied their international sister sites so as to accommodate the best elements of those, while still giving the new site its own unique characteristics. Our senior developer then got to work on a colourful and responsive website design, adhering to best SEO practice both on-page and off-page. Pre-existing and new content was laid out in far more attractive manner than was previously the case, with the user experience becoming easier too, thanks to clear navigation links and calls to action. The site also integrates a repayments calculator and a real-time online application process, as well as linking to special offers from major Flexirent partners. Our clients were delighted with our new design, saying it was exactly what they had been hoping for. Visit the new Flexirent website to see the results of our work.